We’ve all heard about the Law of Attraction, but have you ever wondered why some people have no difficulty manifesting their dreams, while others seem to find life a constant challenge? Why is this? What do those ‘lucky’ people know? What do they do differently? The Seven Secrets of Magic & Manifestation by well-known astrologer Stella Woods provides that missing link, showing you step by step, how to turn the dreams of today into the dream lifestyle of tomorrow! Stella believes if we raise our energetic vibration and operate from a position of love, light and inner strength, not only can we create a magical world for ourselves, but we act as a beacon of light for others to do the same. For more on how Stella views the process of manifestation, read her blog Magicially manifesting your dreams. 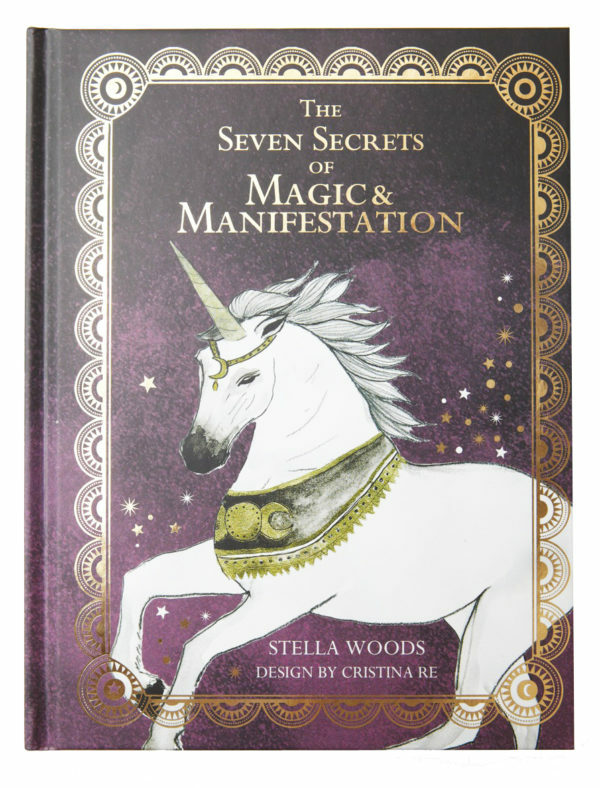 The Seven Secrets of Magic & Manifestation offers a practical introduction to the world of magic based on Stella’s own experience combined with the wisdom and insight gained in twenty years of teaching, healing and consulting. Covering all things magical from vision boards to visualisation; crystals to colour therapy; spells to sound healing and designer rituals to dream busters; this enchanting book will take you on a journey into your deepest desires and beyond! Inspirational yet grounded, spiritual yet practical, The Seven Secrets of Magic & Manifestation is the perfect toolkit for life in the 21st Century. Magical illustrations and layout courtesy of Australian designer Cristina Re. You may also be interested in Cristina’s Magic & Manifestation Affirmation Deck – 33 beautifully illustrated Oracle cards providing you with the inspiration and guidance to envision and manifest your life’s dreams. Stella Woods is the author of the guidebook that accompanies the deck. I wanted to let you know that I bought your book on Magic and Manifestation and it is a beautiful book that is easy to read and follow with wonderful illustrations and great information. Two weeks ago I tried my first manifestation spell and I am eagerly hoping that it works! My friend was so impressed by your book that she also bought a copy of your book and also cast her own spell! I hope to in the next few weeks try out another spell. This spell will be very much life changing for me as I hope to enter a magical new phase of my life as much as it may be daunting for me. It is an amazing thing to be so connected to the universe (when casting magic) and I hope to keep casting magic spells and become better at it with practice and time.